Today’s developers have never learned about this history, or don’t care about it, or actively think it’s irrelevant. … For the same reasons that “open source” came up with a new name, I think the movement that will arise from today’s developers will also need a new name. I decided to try and learn Ada. I love programming languages. This post documents my attempt, and explains what I learned. This is pretty stream of consciousness and basically is a bunch of random notes, so if you hate that, better close the tab. I typed my thoughts up pretty raw, so I may be incorrect in places too. Let me know if you know the answer to something I don’t! Great! 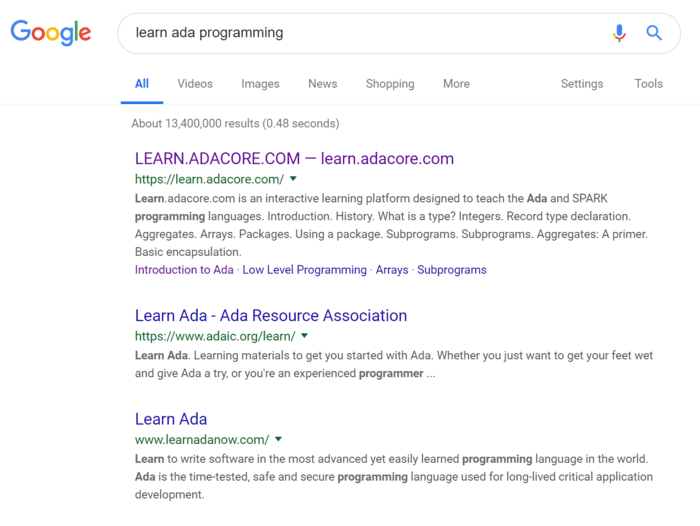 I know that Adacore are sort of the stewards of Ada? Vaguely, that might be wrong. Let’s look at all three of those. Ah, that’s awesome! No installation needed. There’s a war going on. When isn’t there a war going on? But I’m not talking about a physical war here: I’m talking about a war over meaning. This particular war is a fight over what “open source” means. I started working at 15, when I took a job as a pizza cook. Over the next seven years, I moved up the ranks, to a driver, shift manager, and then as part of the “new store opening team.” The franchise was growing, and we needed to help new franchisees open their new stores. I’d travel to where the new store was a week before they would open, help train the new staff, and then work their opening weekend. It was really fulfilling work; if pizza paid as well as tech, I’d seriously consider doing it forever. Each year, we ask the community to write blog posts about what they want to see on Rust’s roadmap for the next year. This is my post for Rust in 2019. In order to get there, here’s what we need in 2019. Today is six years since I first heard of Rust. I wrote a post last year about it. This past year was… intense. Rust 1.31 was basically Rust 2.0, at least in the marketing sense. I burned myself out getting the first edition of the book together for Rust 1.0, and I burned myself out getting the edition shipped. Let’s talk about the bad and the good. Bad first so we end on the high notes. From the perspective of a (fairly large-scale at this point) app developer: I find it great that Clojure places such emphasis on backwards compatibility. In general, migration to newer Clojure versions is completely painless.